When studying architecture (fifty years ago!) 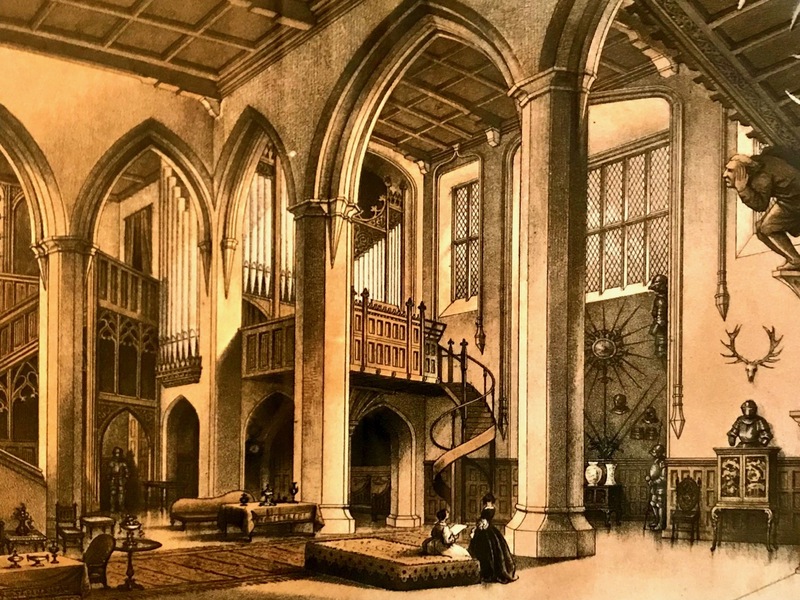 I had little time for what was then generally termed the Victorian Gothic style. It seemed to me derivative, dark and fussy. 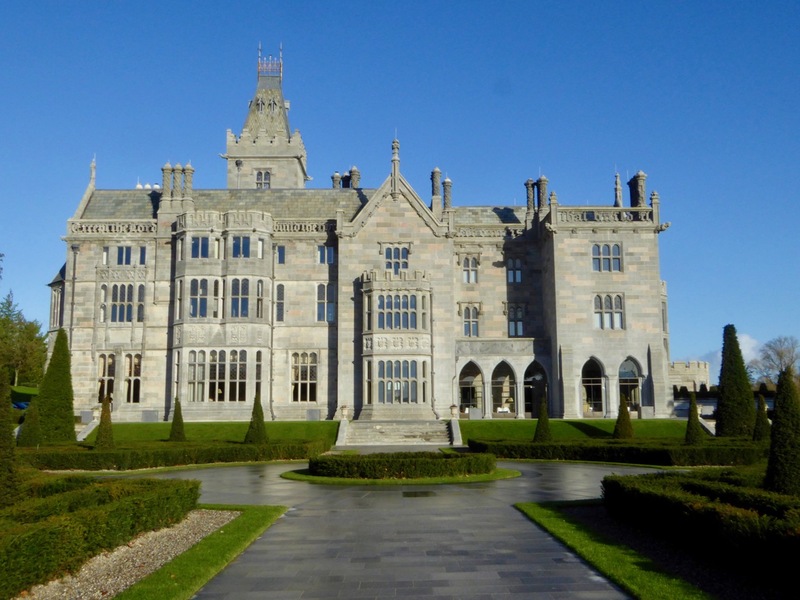 Now, half a century on, I am suddenly a convert – and all because of a visit we made to Adare Manor: surely one of Ireland’s leading five star hotels, but also the finest embodiment of Neo Gothic attributes that I have come across in any building to date. 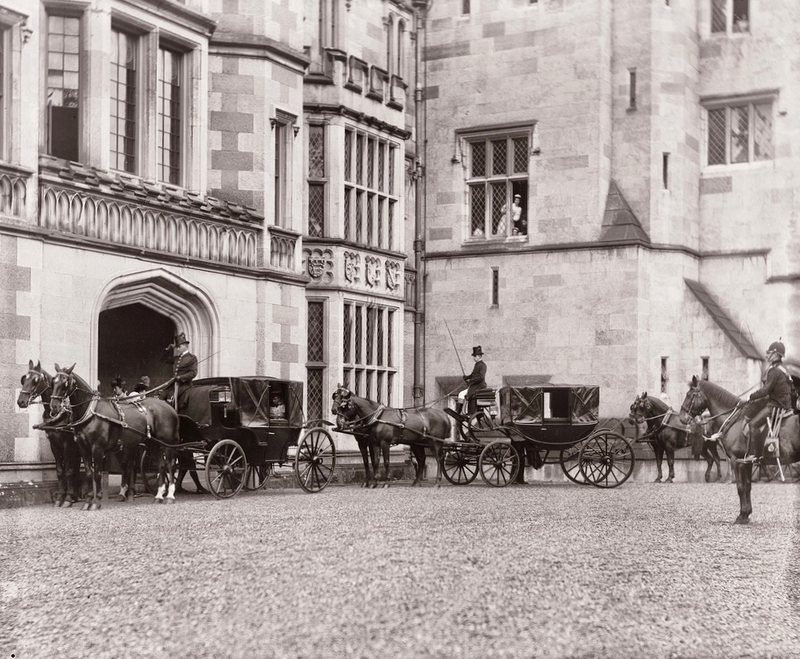 The settlement of Adare, in County Limerick, is a bit of a traffic bottleneck waiting to be sorted out – by a much yearned-for bypass which is likely to take a few years to complete. Once in the village, however, you will find a magical and slightly surreal place with its clusters of picturesque thatched cottages, pubs and restaurants, art galleries, antiques vendors and the greatest concentration of fashion shops and boutiques outside of any city in Ireland (probably). 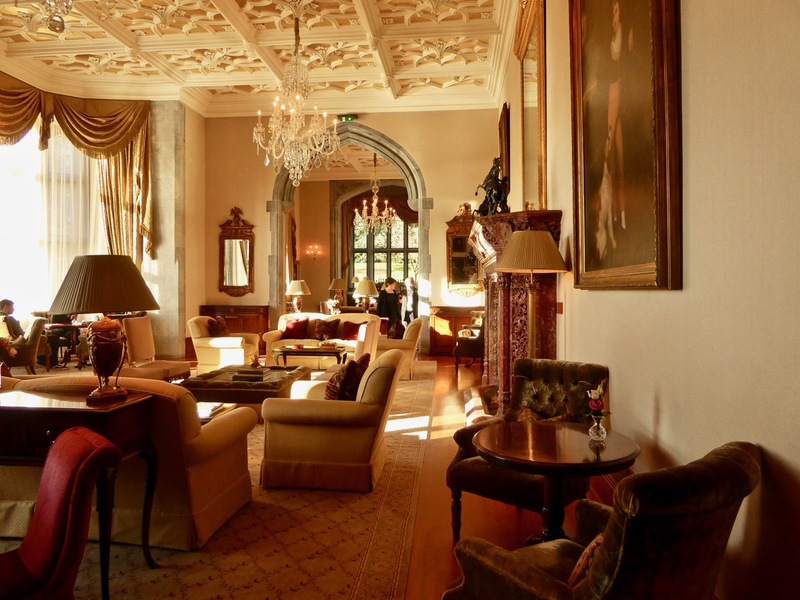 But when it comes to hospitality and architecture, then Adare Manor itself beats all contenders. 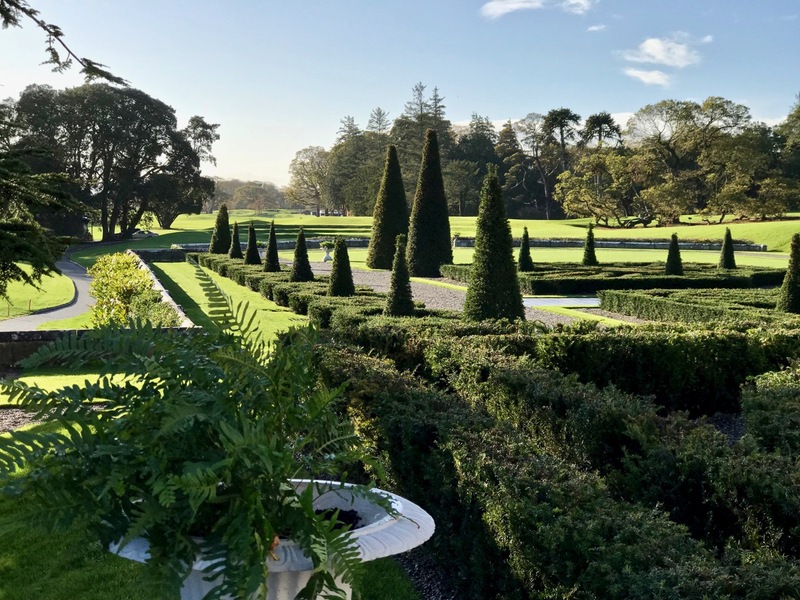 From the superbly landscaped gardens (top – there are 840 sweeping acres on the estate), through to elegant interiors (the drawing-room, centre, is a prime example), the mansion is on a grand scale and very much reflects, today, the spirit in which it was reincarnated in the 1830s (lower – the Great Hall) by the splendidly monikered incumbents of that time: Windham Wyndham-Quin, 2nd Earl of Dunraven and Mount-Earl and his wife Lady Caroline Wyndham, heiress of Dunraven Castle, Glamorgan, Gloucestershire. The Manor House as remodelled by the Second Earl is a riot (Dunraven ravens, above). Known to have always actively pursued outdoor life, riding, hunting and sports, it is said that Windham was laid low by an acute attack of gout. Lady Caroline encouraged him to channel his frustrated energies into a building project: to modernise and enlarge their modest Georgian residence. 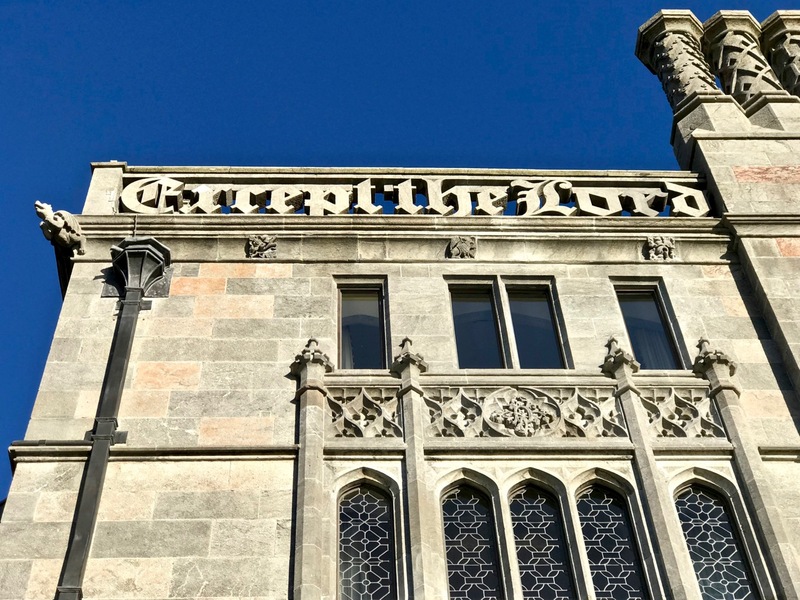 The Earl rose to the challenge and embraced the exuberance of the fashionable Gothic Revival style of architecture. 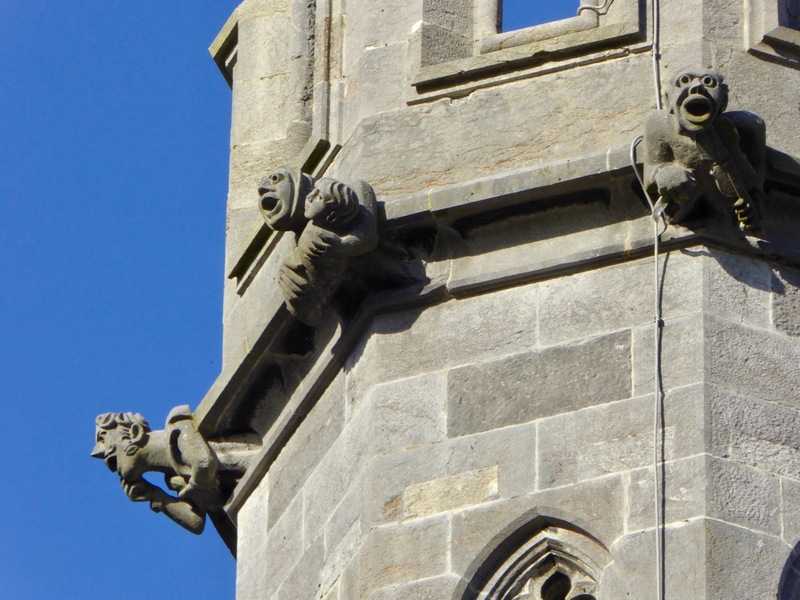 In respect of architecture, the 2nd Earl was ahead of his time in pursuing medieval themes and must, surely, have been endowed with a good sense of humour. 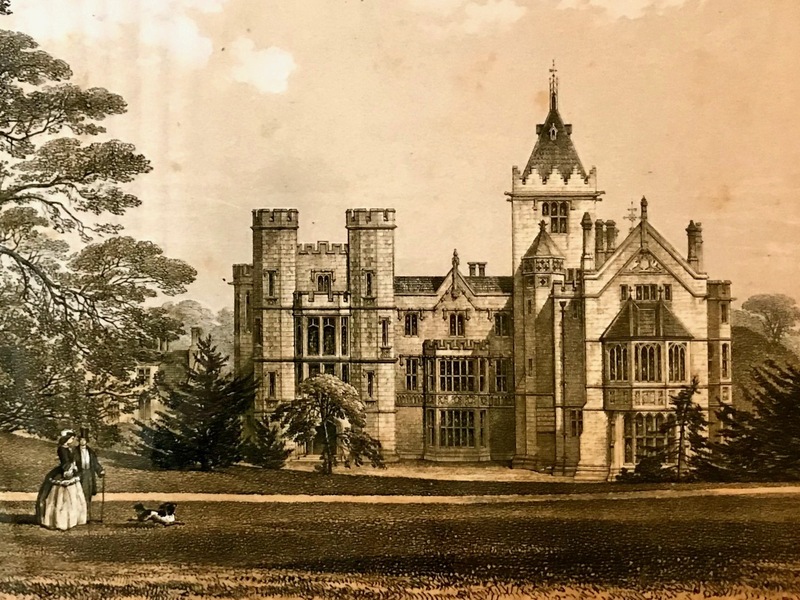 Lady Caroline always loyally stated that all the ideas in the remodelled house were Windham’s; however, we know that the ‘Gothic architects’ James and George Pain were involved, as were Philip Charles Hardwick and Augustus Pugin, in a project that spanned three decades. 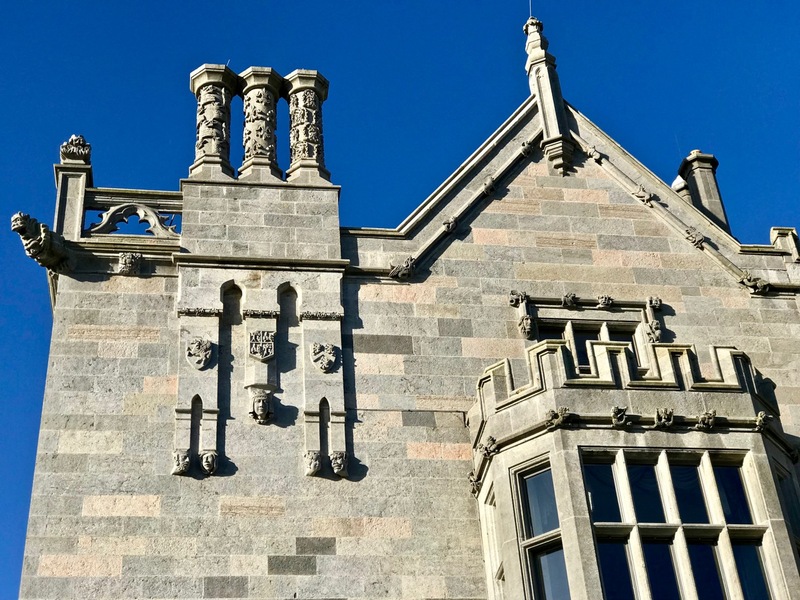 The craftsmen stonemasons of Adare were kept very busy – and fully employed – throughout the building period, which encompassed the worst years of the Great Famine. 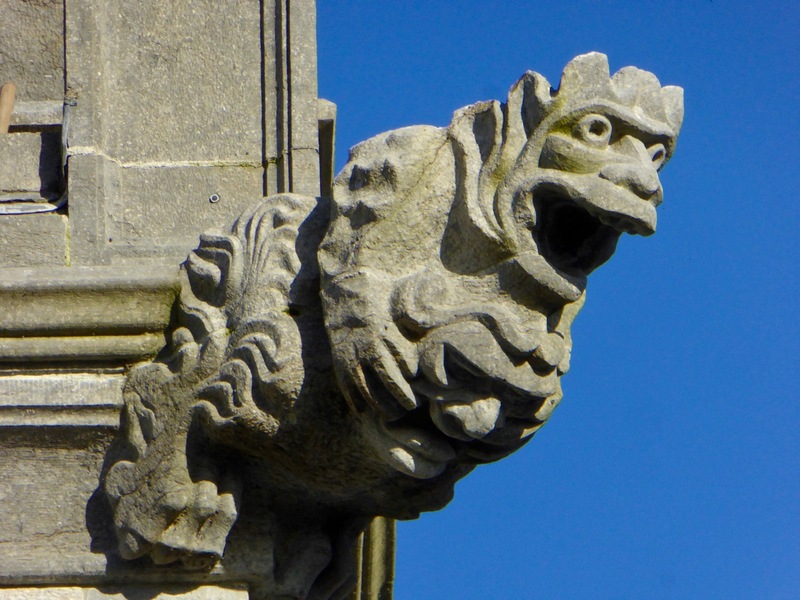 As were the woodcarvers. One room in the Manor – the Long Gallery – spans the whole width of the house: 40m long and 8m high. It’s now the ‘informal’ dining room. 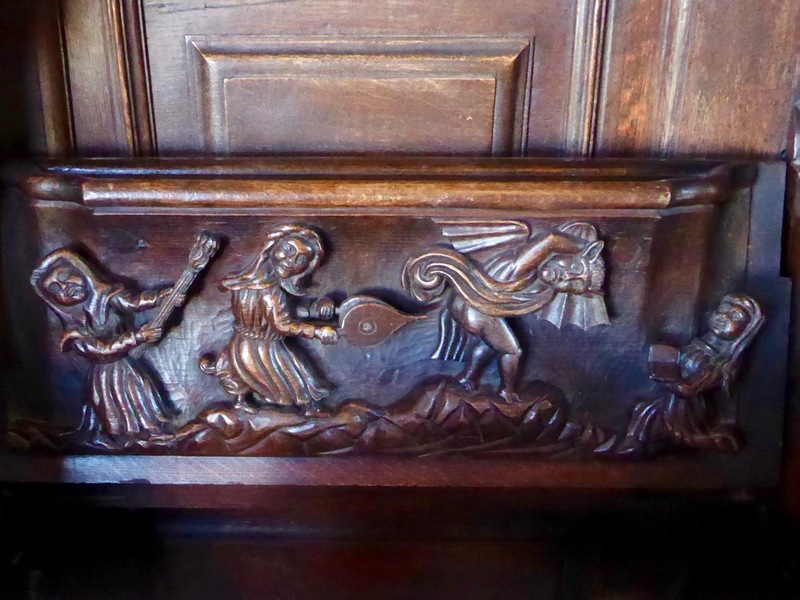 It has a magnificent array of carving, some – the choir seats – brought in from Flanders and dating from the 17th century (see the enigmatic example in the first photograph below), but most purpose-made locally for the new Manor. Each one tells a story. We need to go back again and spend more time there (please) just to even get a glimpse of all of them. 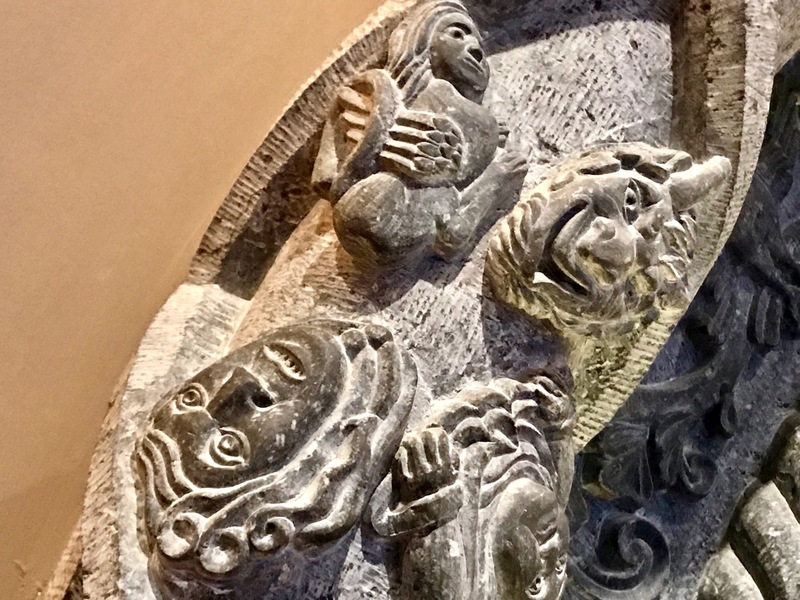 By the way, if you want to see real medieval carving, have a look at this post of mine, from the West meets West series. 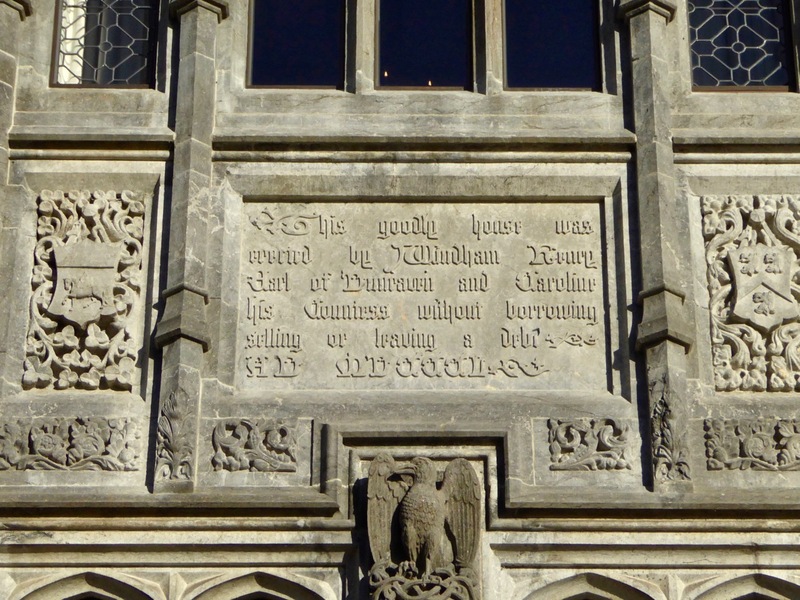 Lady Caroline was just as industrious as the Earl in contributing to the project and in creating employment through the famine. 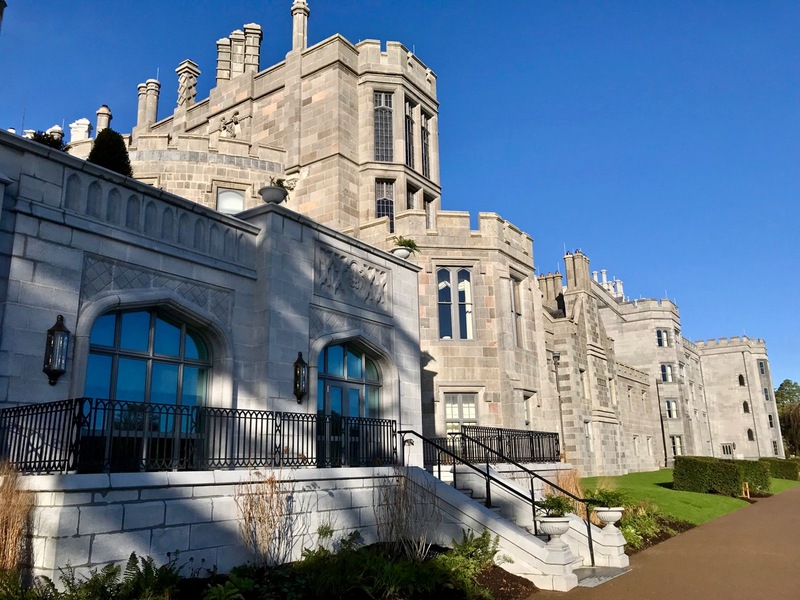 She established a School of Needlework to develop marketable skills and opportunities for local women: some of the work of the School graces the walls of the Manor. 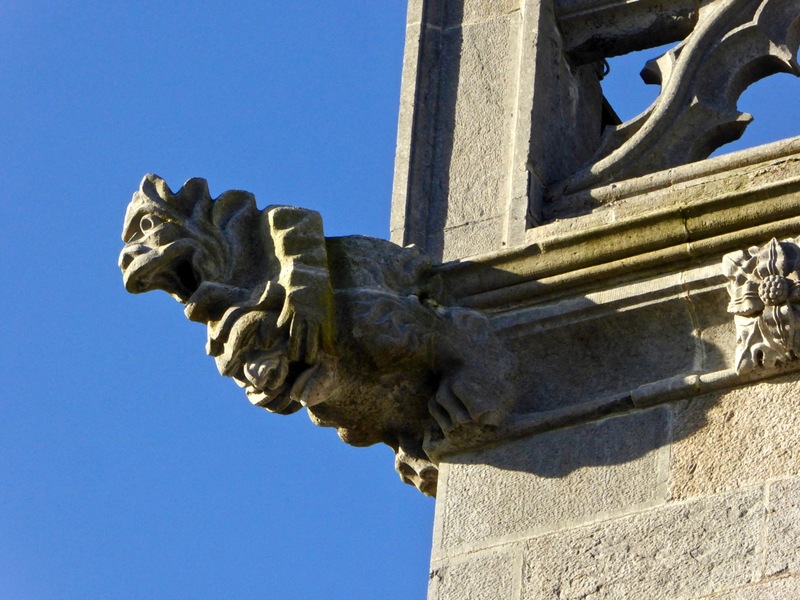 In fact, the work of local craftspeople is prominent throughout the interior of the building. Below left is the Long Gallery, showing off decorative work on the ceiling, tapestries and stained glass. 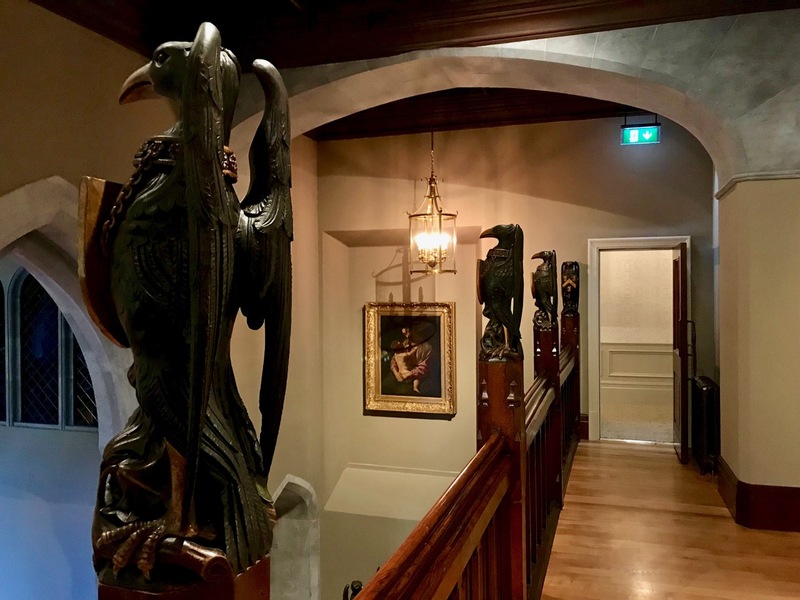 On the right is a carved stone figure that looks down on guests in the Great Hall. 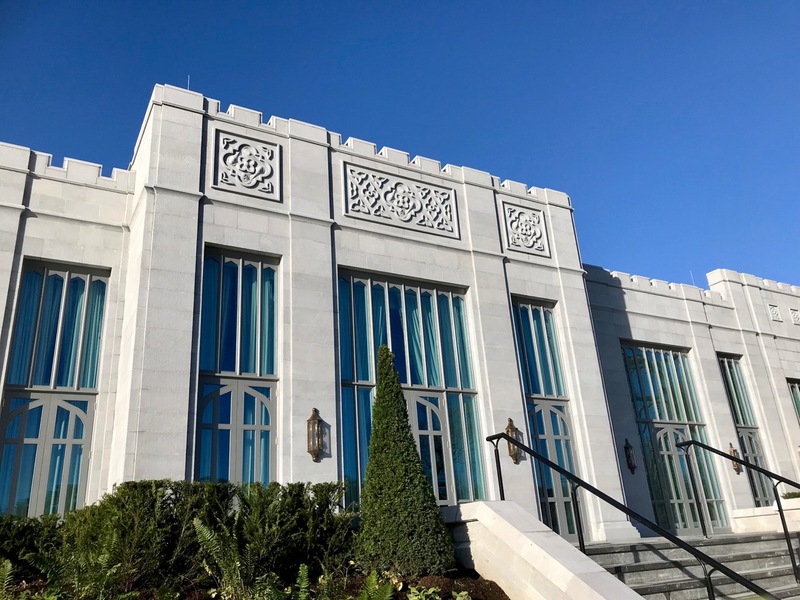 This charming spot was my home of unclouded happiness for forty years: may Heaven’s choicest blessings be poured with equal abundance on its present and future possessors! 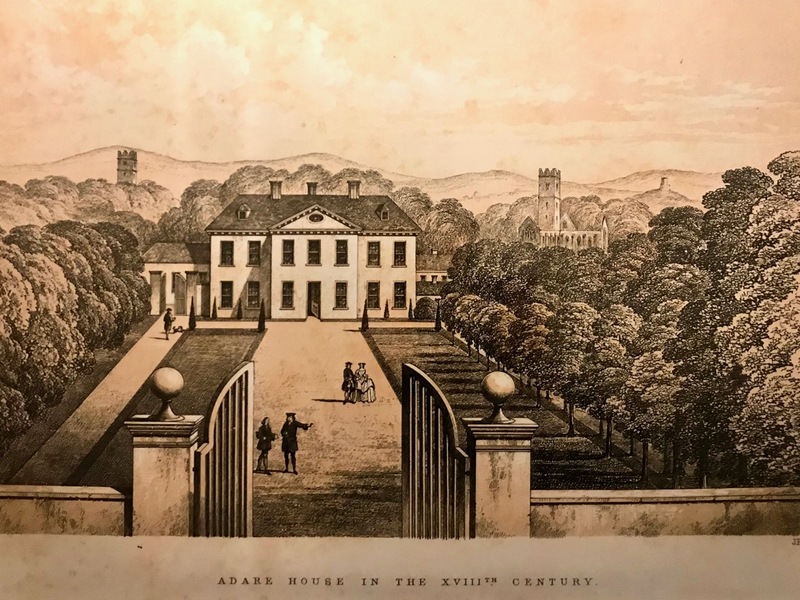 In my post From Skibbereen to the Moon I wrote about the Clerke family of Skibbereen, but particularly about Agnes, who became one of the foremost astronomers and science writers of her day. But Agnes was one of a trio of remarkable siblings, each of who distinguished themselves as intellects and writers and I wanted to learn more about her sister, Ellen, and her brother, Aubrey. In the process, I came up with questions that reach into the heart of Skibbereen, and Irish, history. But first – the Clerke (pronounced Clark) family: all three siblings grew up in Skibbereen, above the bank that their father managed. They lived through the Famine: John Clerke was one of the subscribers to the soup kitchen relief effort. After moving away in 1861, and apart from the years the women spent in Italy, the family lived together for the rest of their lives. While Agnes wrote mainly (although not exclusively) about astronomy, Ellen was more literary in her leanings, publishing extensively in the areas of poetry and criticism and writing in three (at least) languages. The book for which she should be most justly remembered is Fable and Song in Italy. Ellen’s objectives with this book were twofold: to trace the influences on popular Italian song and to to introduce English readers to Italian verse. In order to do this she must have possessed an encyclopaedic knowledge of the great Italian poets and the ability to translate Italian verse to English verse. This had to be an incredibly difficult undertaking, not least because she was translating archaic Italian into a more contemporary language (that is, of her own time) in order that the “beauties” of the verse would not be “disguised by the obsoleteness of the language.” She begins in the Renaissance with the Fifteenth Century Boiardo, author of Orlando Innamorato, a classic of European chivalric literature. 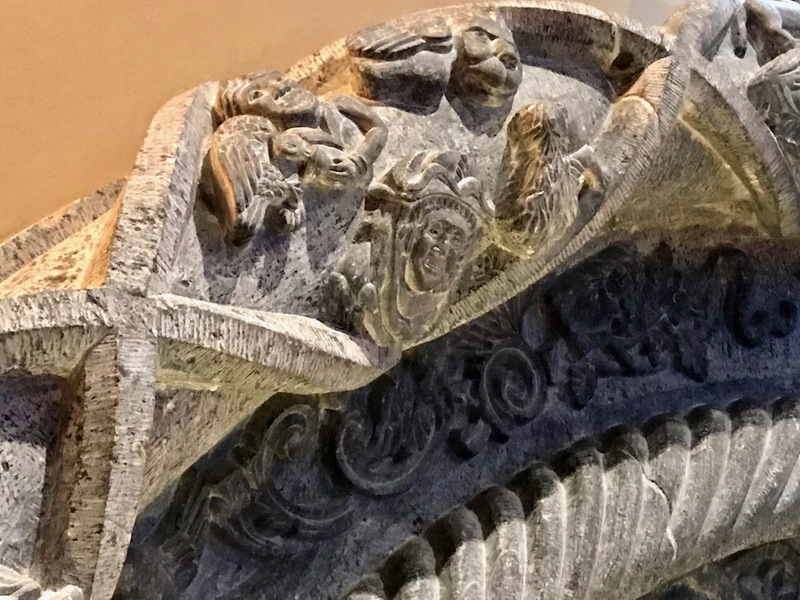 Her account of the piece Charlemagne’s Tournament from Orlando is complete with the story itself, discursive asides about the numerous characters and translations of selected verses. Ellen wrote for various magazines, especially The Tablet (a Catholic periodical which she also helped to edit), the Cornhill Magazine and the Dublin Review (another influential Catholic journal, actually published in London). Although she never reached the stature of Agnes in astronomy, she was likewise interested in that subject and wrote two monographs on Jupiter and on Venus. A review of Jupiter and his Systems calls it a “capital little pamphlet” (it was 40 pages) and says it presents “a complete popular account of our present information regarding this planet and its satellites…in an interesting and straightforward way, equally removed from dullness and from the faintest traces of “smart writing.”” She wrote literary studies in German and she studied Arabic to the extent of using original Arabic texts in her research. She was a highly regarded member of the Manchester Geographical Society (which admitted women!). One of her pieces for them was about Australian aborigines which was described as a “striking refutation of the generally held belief about them”. Another one of her journalistic essays was about the dock labourers strike of 1889 in which she displayed her understanding of economics, her insistence on factual information (she used extensive statistics) and her empathy for low paid workers and their families, although in general her politics were conservative. I couldn’t find the text of Ellen’s novel online, but I did come across a poem she translated from French, with the same title. 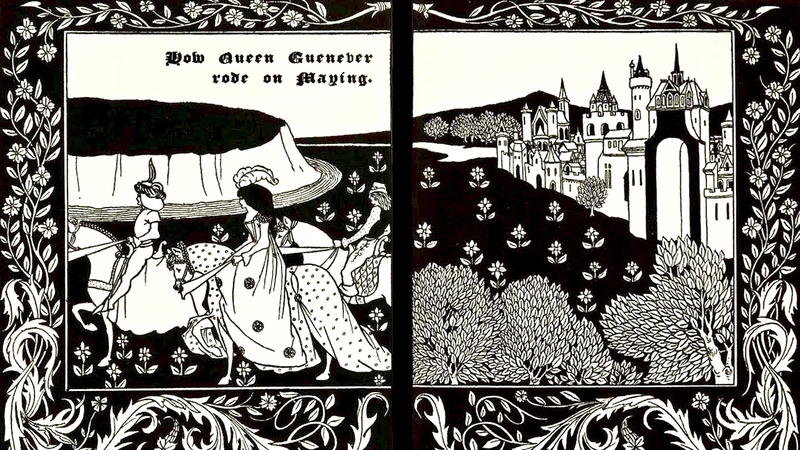 It was published in The Yellow Book – a very smart quarterly with cover designs by Aubrey Beardsley. I have appended the poem to the bottom of this post. It’s interesting to note, in this regard, that when the Clerkes lived in Skibbereen, in the Bank House on Bridge Street, O’Donovan Rossa, the Fenian leader, was running a business further up the same street. Did John Clerke, in his capacity as the Bank Manager, have dealings with Rossa (who ran into financial difficulties with his seed business)? How did the conservative Clerkes feel about the Phoenix National and Literary Society that Rossa founded with the aim of liberating Ireland ‘by force of arms.’ How usual or unusual was it for staunch Catholics, such as the Clerke siblings, to be committed unionists and anglophiles? How would Aubrey feel, do you think, if he knew that the other memorial plaque on Bridge Street is to honour the memory of a Fenian? Agnes and Ellen died within months of each other. Aubrey was the youngest of the family and the last to survive, living on alone in the grand house in London, becoming in the end reclusive. I can find no photograph of him or of his father: in this family it is the women who are most remembered. To his credit, Aubrey never seemed to resent that, remaining proud of and devoted to his two extraordinary sisters always. Higher than Chimborazo’s crown was cast. The lava—hardening—gives it peace at last. The burning cactus blazes into bloom.